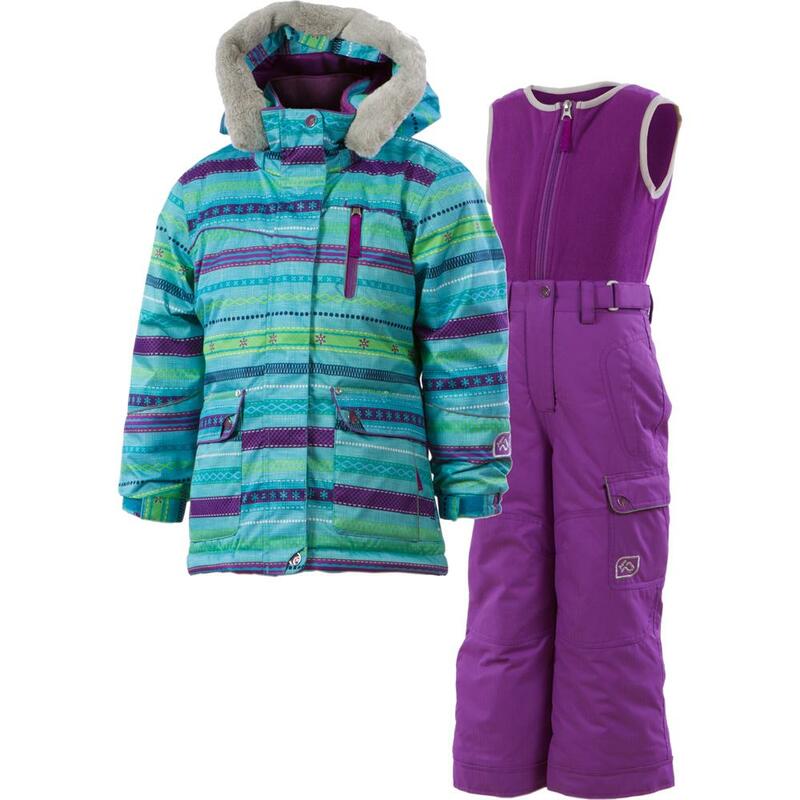 Jupa’s Maya 2-Piece Ski Suit is a cute, matching ski outfit that helps her stand out on the slopes. She’ll stay warm and dry thanks to waterproof fabric, critical seam taping, and cozy insulation. Elasticized inner cuffs and a powder skirt help to create a snow-proof seal. A removable balaclava keeps her face warm in the worst weather, and then tucks neatly inside when the sun comes out. The sleeves and cuffs are extendable so when she grows her ski suit will still fit. The Maya Suit is durably built to last many seasons in the snow. "Is the upper fleece part of pants detachable/removable?" "No, it does not detach. On this type of suit, in kids sizes, you will find that most of them do not detach. " "Does this jacket have the balaclava, removable hood, removable fur collar, any inside pockets?" "This model is brand new for 2012 and features the Detachable fake fur hood, removable balaclava, grow cuffs to extend 2" longer, removable extendable hood, snowbelt with elastic gripper, and an inside pocket for goggles as well as pockets on the bib. " "Does it come with the fleece face mask?" "It does come with a removable balaclava to keep your little one protected from the cold weather. With so many extra features, this set is definitely a winner!" "Is this a Toddler sized suit or is sz 7 appropriate for a 6.5 year old?" "For an average size 6.5 year old, the size 7 will work perfectly. Checkout the sizing chart located to the right of the photo for a perfect fit!" "My daughter is btw. the size 6 & 7 according to the sizing chart. Is it possible to get the sleeve and inseam measurements for the size 6 and 7?" "The sleeve for the size 6 is 19" and the inseam is 20" and on the size 7, the sleeve is 20" and the inseam is 22". " "Is there a difference between the kids 8 and the girls 8." "No, they are the same size. The styles will vary but the measurements are the same." "Is there a mix up with the sizing chart for Kids and Toddlers? The kids' measurements are bigger than toddlers'. For example the smallest... Kids'SIZE 8- Height 51-54. Toddlers' SIZE 2- Height 33-36. My girl is 61" , what size should i get her?" "No, the sizing chart is accurate. Please call us if you have any questions. Your girl is going to need a girls size 14 not toddler. " "How waterproof is this suit compared to an equivalent spyder or northface suit? We often get rain and wet snow where we ski. Also do the pants also have grow cuffs?" "This suit has 5k waterproofing which is pretty great! Depending on the Spyder suit, it may have the same waterproofing or Spyder may have 8 or 10k. This does have the grow cuffs." "I can't tell from the picture. What color are the pants in the Tutti Frutti Print? Thanks in advance." Santa brought the Jupa Maya 2-Piece Sz 8 (Intense Pink) for my just turning 8 year old daughter. She wore it all week for Christmas Break skiing during full day snow conditions. She remained warm, dry and was very visible which is incredibly important. My husband said this is the best made suit he's seen and I agree. We absolutely love it and should get 2-3 seasons out of it. Worth every penny and loved the fact that the balaclava comes with it!